Just ANutter paper crafter...: Aloha! 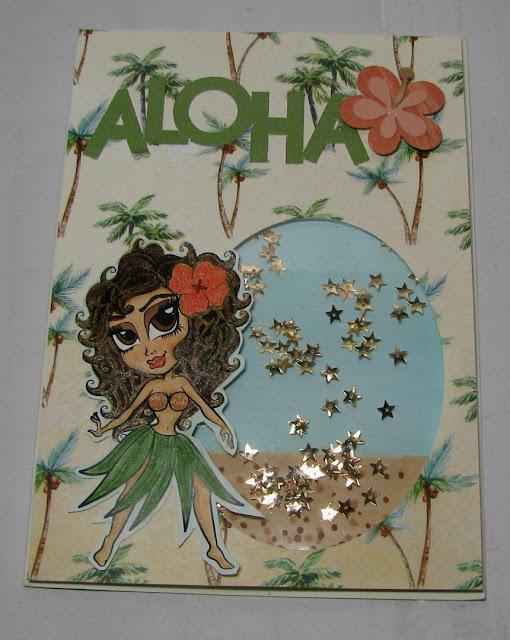 This month at Die Cut Diva's we would like you to share with us your summer vacation, via cards ( or the papercraft of your choice), or maybe make a card sharing your dream vacation! Just remember you must always use at least 1 die cut or embossing folder, and most of all have fun! I used a My Favorite Things Oval Die to cut into the background designer paper by Ella & Viv. I used my Copics to color in a beach & sky, and used Elmers foam lines for the shaker oval. I happened to have gold sequin stars in my stash, and figured they could be starfish or heavenly stars! I colored the Hawaii Betty with my Copics, and highlighted her hair with a gelly glitter pen. The sentiment was cut with my Cricut using the Life is a Beach cartridge, and scraps from my stash. One of these days, I will go to Hawaii. It's a dream vacation for me. I'm also entering this at the Cut it Up Summertime Memories Challenge. Your little hula girl is so cute! I love the addition of the hibiscus flower and the star sequins. Thanks for linking to Cut it Up for our Summertime Memories challenge! FANTASTIC shaker card! Great coloring and perfect background paper!